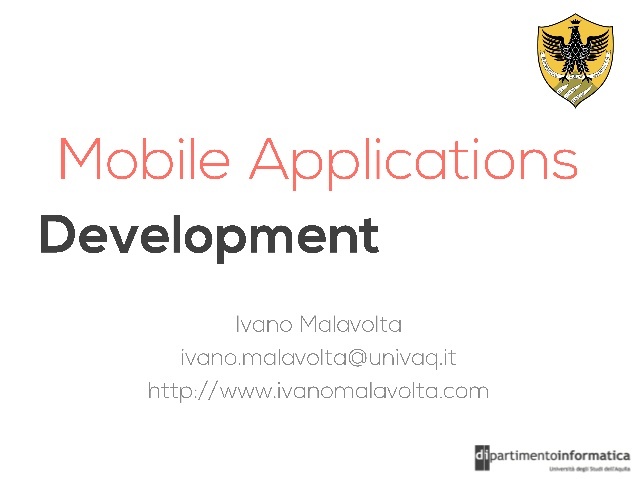 Today I made the first lecture of my course “Mobile Applications Development” here at the University of L’Aquila. and I will never get tired of saying it! Here you can find the slides of my lecture, together with the slides of my introductory lecture of the course. Ivano has a PhD in Computer Science from the University of L’Aquila, Italy. He is especially interested in investigating on how MDE techniques can be exploited for architecting complex software systems at the right level of abstraction. Currently, his research activity is positioned in four main fields: software architecture, Model-Driven Engineering, mobile-enabled systems, robotics. He is program committee member and reviewer of international conferences and journals in his fields of interest. He is a strong advocate of applying academic research results in real scenarios, and he is working on projects that have been awarded as the most innovative solutions in both national and international venues. He is member of the ACM and the IEEE. It would be great if you could keep posting your presentations of that course!